From toys to snack cakes, Sanrio's ever-famous cat can be seen peddling everything. Including beer. Now, the Internet and history has shown that Hello Kitty has graced the face of beer bottles before: At one point there was even a Hello Kitty licensed beer which was produced by Becks. However, this time, her feline visage is now gracing the fronts of cans and instead of a global audience, this version of Kitty beer is in China. Licensed by the Shanghai KT trading company and brewed by Taiwanese beer maker Long Chuan, the Hello Kitty beer isn't your average beer—they're fruit-flavored wonders. 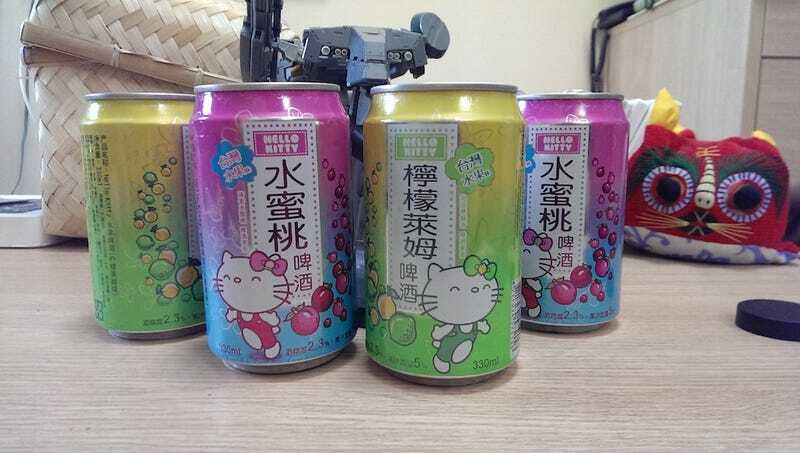 So far, there's only been two flavors spotted in Beijing: Hello Kitty Lemon Lime flavor and Hello Kitty Peach flavor. According to Long Chuan's website, and my local 7-11 clerk, there are more than 6 flavors of the beer, including passion fruit and banana. All of the beers come at 2.3% alcohol by volume, which isn't much if you take it at face value. However, these beers are dangerous. They're so ridiculously smooth and tasty that one can barely tell they're drinking beer. It's almost like drinking fruit juice, even if the cans do say "beer" (啤酒 or pi jiu). These aren't the same as say Belgium Ales made with fruit. They're nothing like a Duvel or a Blue Moon (yes, I know Blue Moon is American). These beers are closest to Chimay but with stronger fruit flavorings. The fruit isn't a note or a sense in these beverages but instead the overpowering star of it all. The lemon lime flavor tasted like a light limeade of sorts, almost losing the lemon flavoring. It was smooth and sweet, like a lime soda. It didn't taste like beer. The lime flavor was the strongest flavor in this brew. The peach one also tasted more like fruit juice than beer. It was good, but sickly sweet. Again, you can barely tell it's beer. The only downside to the peach was that because it was so sweet, there was this weird almost soapy after-taste at the end of each sip. The peachy-soapy flavor does linger on until something washes it away. It took me three beers to get buzzed. Three. Now keep in mind, I'm a big dude. Nowhere near as big as our resident big man Mr. Mike Fahey, but I'm a healthy 5'11 and 196 pounds. These beers, apart from the Hello Kitty marketing, also had something that Mainland Chinese are crazy for: Taiwan. On the cans the fact that the beers are "Taiwan fruit flavored" is prominently displayed, which kind of makes sense since fruit flavored beers are huge in Taiwan. Taiwan's own Taiwan Beer is currently doing very well in China with its pineapple-flavored beer—a brew that I quite enjoyed, myself. If only it were this cute!